Good morning! 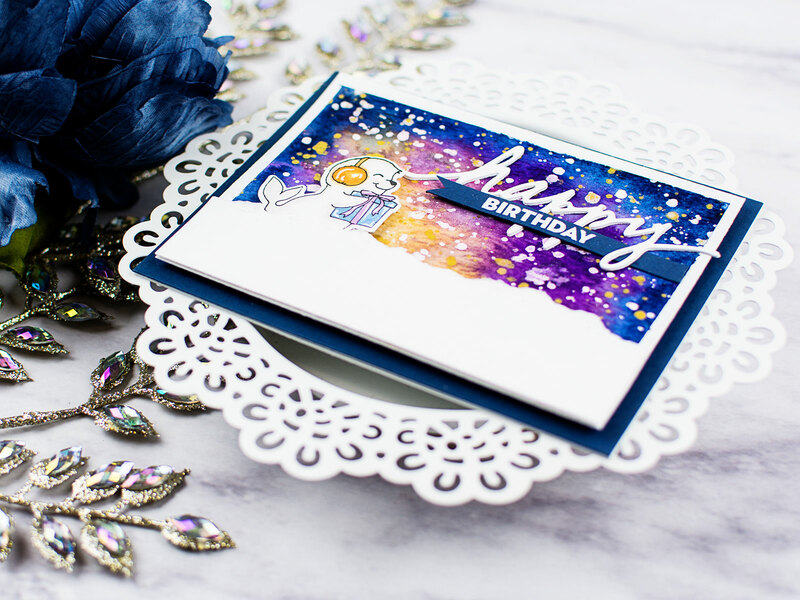 Heather Hoffman here to share my challenge for the Winnie and Walter 4th Birthday Bash! I'm calling my challenge Watercolors with a Twist - so aside from the obvious of using watercolors in your project, I want you to incorporate another type of coloring as well! It can be Copic or other alcohol markers, colored pencils, even distress ink blending counts! Or you can get creative and add shading with an ordinary #2 pencil, add some white gel pen accents, or pull out your kids crayons. Wherever your imagination and inspiration takes you! I colored it in with Copic markers and added some accents with a white gel pen before die cutting with the Coordinating Dies. I tore the edge of a white sheet of paper, mounted it with foam adhesive over my background, then added my sweet seal with foam adhesive as well, but tucking the bottom under the paper so it looked like it was nestled in the snow! Finished off with a die cut "happy" from In a Word: Happy Cutaways that I die cut two times from white cardstock and layered together to make it a little thicker, and an add on sentiment from In a Word: Happy stamp set heat embossed on a strip of navy cardstock that I hand trimmed into a banner. I can't wait to see what you create - and hope you will play along with all the fun challenges!!! So pretty and love the Galaxy background! 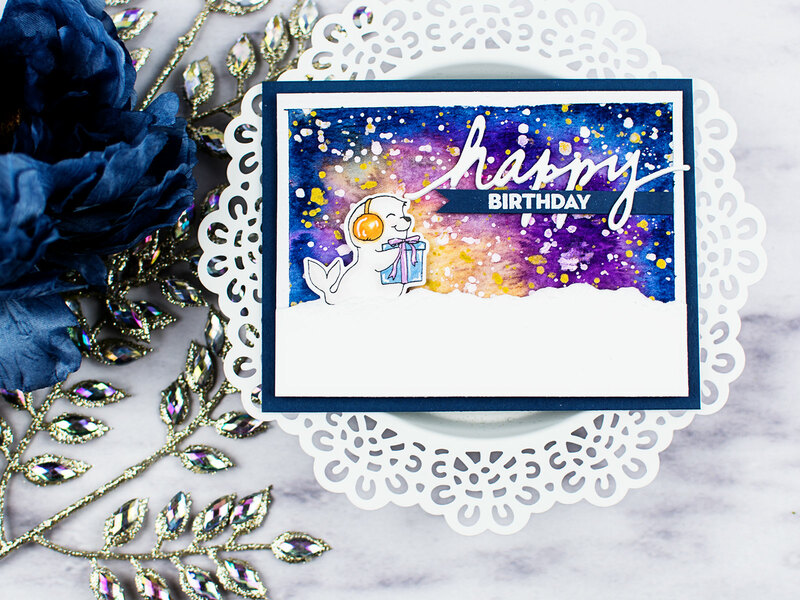 Love the perfect amount of splatters! 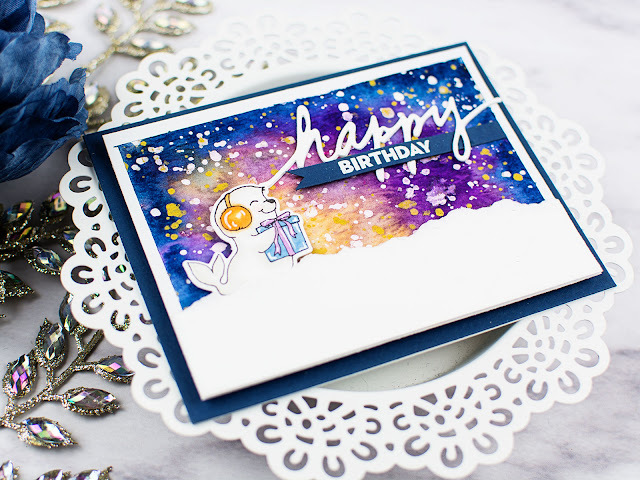 Great twist on watercoloring! Such a sweet and happy card. Love this challenge! beautiful scene with such vibrant colors. 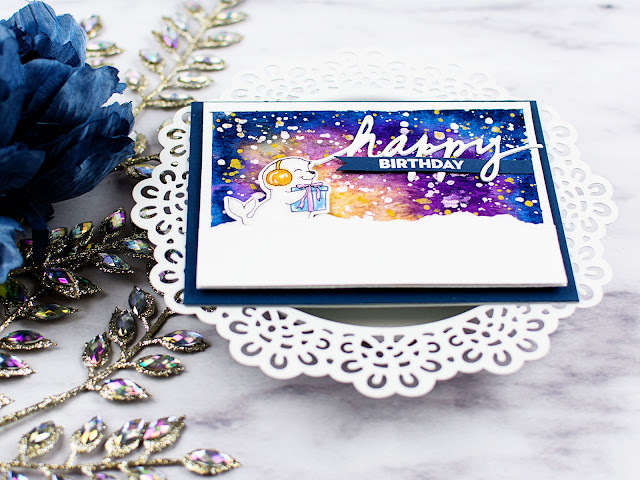 Such a cute card, Heather, & fun challenge! Such am awesome card..Love the wonderful background. This is fun! I love the background you have created.